A Kentucky disability lawyer who pleaded guilty to stealing nearly $600 million from the government has disappeared, the FBI said Saturday. 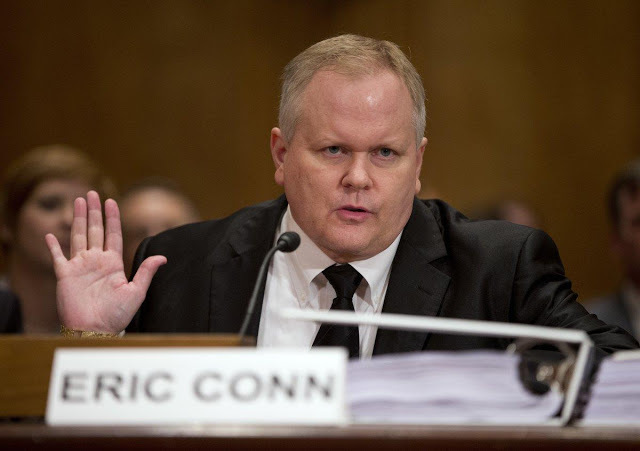 Eric Conn, 56, removed his electronic monitoring device,violating his bond agreement, the FBI’s Louisville office said, adding the lawyer’s whereabouts are unknown. Conn’s lawyer, Scott White, told The Lexington Herald-Leader, that he’s “extremely concerned” about his client and urged him to turn himself into the authorities. In March, Conn pleaded guilty to stealing from the Social Security Administration and bribing a judge. His sentencing was scheduled for next month and he was ordered to pay back millions of dollars to the federal government. After his April 2016 arrest, prosecutors charged that he should stay in jail over risks that he could run away. An FBI agent testified at a hearing that Conn’s employees heard him say he would flee to Cuba or Ecuador to avoid being charged and that he had wired money out of the U.S., The Lexington Herald-Leader reported. A U.S. Magistrate judge allowed Conn out of jail under the condition that he wore a GPS device during house detention and that he gives up his passport. The U.S. District Court issued a warrant for his arrest on Saturday. Conn began practicing law in 1993 and turned it into one of the most well-known firms in the country. He’s also known as “Mr. Social Security” and has built a television persona by starring in commercials. The lawyer was eventually busted when federal investigators found he had bribed a doctor and a judge to approve disability claims with medical evidence.